Simply prepared with simple ingredients, revithosoupa – accent on the THO – is a hearty, healthy dish that will warm you through. And this delicious (gluten free!) 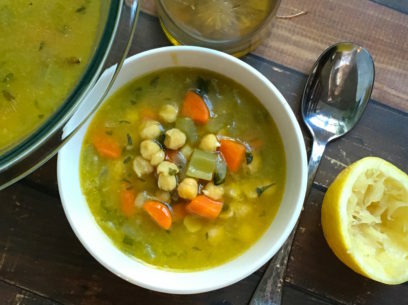 authentic chickpea soup with carrots, celery, sage and thyme cooks up all in one pot for easy cleanup! The sweet veggies are a nice balance to the more earthy herbs and the olive oil brings everything together beautifully. Chop your vegetables into pretty small pieces – ideally you’re aiming for at least 2 pieces of veggie in every spoonful. I do peel my carrots here but not the celery, and use white as opposed to red onions. I’ve also had this dish with leeks instead of onions but not my fav to be honest. Totally up to your preference, peel or not to peel – I’ve learned that some people have strong feelings about peeling! And, traditionally, celery leaves are used in this dish and not parsley. I sub in parsley because it’s often hard to always get celery with the leaves still on the stalks and even then, it’s tricky to get a full cup of leaves from one bunch of celery. Some people will substitute cilantro here for the celery leaves but I think cilantro is way to overpowering to the rest of the dish and completely throw off the whole balance of the soup – can you tell I’m anti cilantro here?? The parsley has just enough barely bitter brightness that comes right through and perfectly complements the other flavors and that’s just what we’re looking for. These steps transform this dish from a regular soup to a real meal. And please don’t be put off by the arrowroot. Arrowroot flour is easy to find in just about any grocery store in the spice aisle. I like the Bob’s Red Mill brand here and there are plenty of other good ones readily available. It’s a traditional thickener and naturally gluten free. And if you want to use all purpose flour instead, go right ahead. The results will be fine, I promise. And re: the chickpea foam, by not skimming off the chickpea foam that automatically boils up as they cook, you keep more of the protein AND give a fantastic lightness to the broth. Win win! Just gently stir in the foam as it forms on top of the boiling chickpeas. You’ll be chopping your veggies then and probably near the stove anyway so no extra work involved. This simple step really makes a big difference in your finished dish. Cook dried chickpeas in 8 cups of water with sage and bay leaves at a low boil for 1 hour. Gently stir in any foam that rises to the top while cooking. 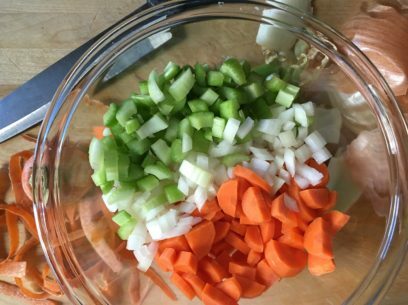 While chickpeas are on the stove, chop carrots, celery, onions and parsley. At 1 hour, chickpeas should have boiled off most of the water so add an additional 4 cups of water to the pot. Chickpeas should be firm but squash if you pinch them. At the same time, add in all of your chopped veggies with the salt and pepper, keeping the chopped parsley and thyme stems aside for now. Cook on low boil for 20 minutes. Add oil, parsley and thyme stems. Stir and remove 1 cup of hot broth into small bowl. Add 2 tbsp arrowroot powder (or all purpose flour) to the small bowl of hot broth and stir until completely dissolved. Add broth back to the pot and stir well to incorporate. Continue to cook soup for 10 more minutes. 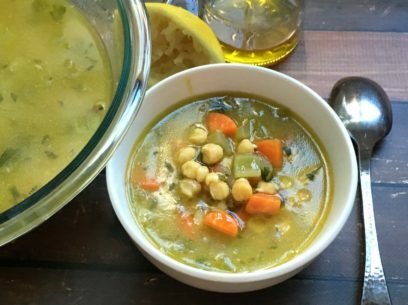 When ready, chickpeas and vegetables should be tender, not mushy, and broth should be a creamy golden yellow. Remember to remove sage/bay leaves and thyme stems before serving!! Serve from the stove with a nice crusty bread. Note: a thin skin may form over the top of this soup if left for a bit – just give it a quick stir to incorporate back into the soup. And feel free to add a squeeze or two of fresh lemon juice to your bowl or add in the optional 3 tbsp of lemon juice to the pot when cooking is done. 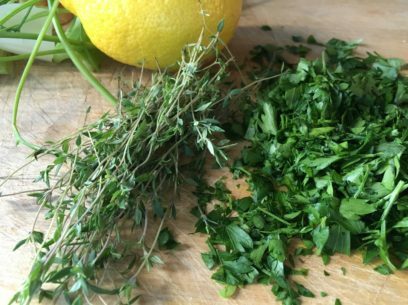 For a pretty presentation, garnish with lemon zest and fresh thyme leaves. Made this tonight, it was delicious! 🙂 I used 1/2 teaspoon dried thyme in place of the thyme stems and that worked out well. Making this tonight!! Does it make any difference to soak the chickpeas beforehand? 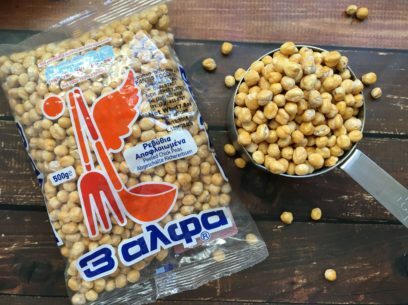 Soaking chick peas makes them easier to digest as the process reduces or even eliminates the phytic acid inherant to all legumes. I just made revithosoupa, it’s truly delicious. I doubled the recipe with the exception of salt I used 3 tsp, also did not have dried sage instead I used fresh and for the olive oil I stuck to the half cup. cannot wait to try this! Can you use canned chickpeas? I will, though, experiment with canned chickpeas in the next couple weeks and report back here with the results! I fell in love with it living in Crete in the early 70’s. In the winter, when the lemons are not quite ready, the villagers season it with a spoonful of vinegar and LOTS of oil at the table. They also make it with garlic and a handful of rice for a thickener instead of flour. Chana dal are peeled chickpeas and should work well here. i would suggest though that you consider cutting down the initial cooking time. might be safe to check chickpeas for doneness at 30 minutes and then at 10 minute intervals. this is because split legumes have a tendency to cook faster 🙂 would love to hear how it goes! This recipe made such a delicious dinner for our family. I only had canned chickpeas, so I made the broth with the vegetables, then added the chickpeas about 10 minutes before the end of cooking. It was delicious! I was also lucky enough to have a big bunch of biodynamic celery with lots of lovely green leaves in the fridge. The celery leaves gave the soup a beautiful flavour. Thank you for this post! This was SO GOOD! I made it while we were visiting grandma, and she liked it, too. I served this to my carnivorous son and he said it was good- he has only 3 words for food and good means very tasty mum you can cook this again!